Our new seat is posChair 1, it has replaced our wave stool. 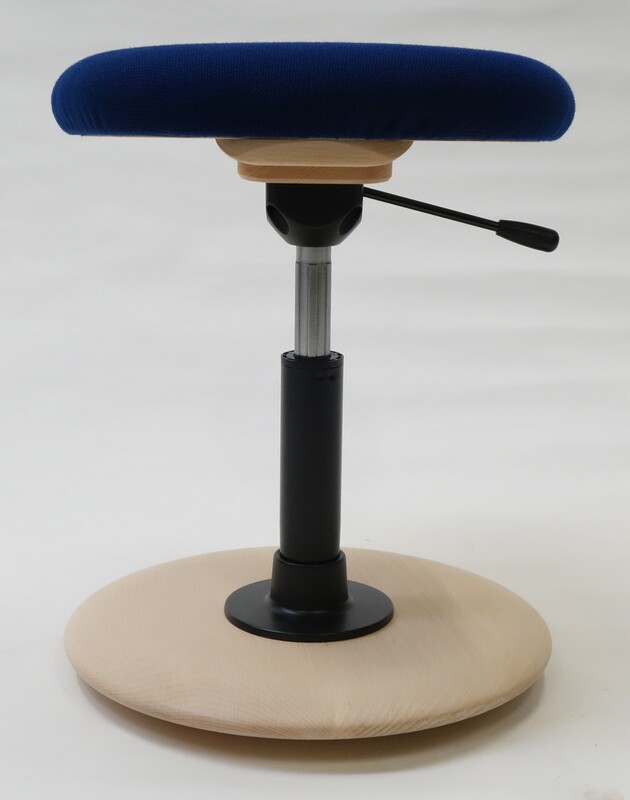 It has a circular beech rocker that can rock in all directions, and a height adjustable gas lift. 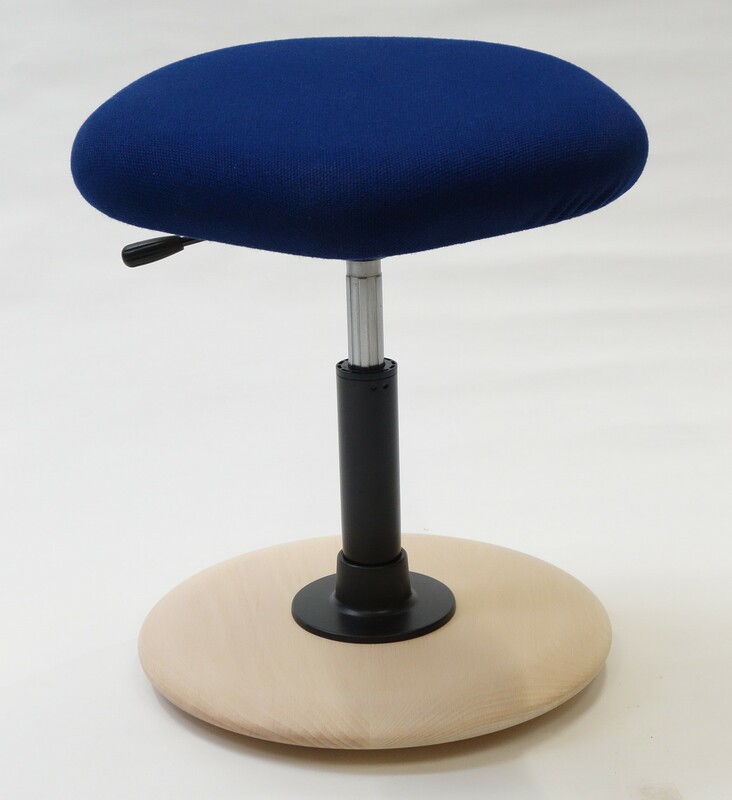 Like our wave stool it uses the combination of a rocker to engage your own balance, and a forward sloping seat to help you to balance upright. 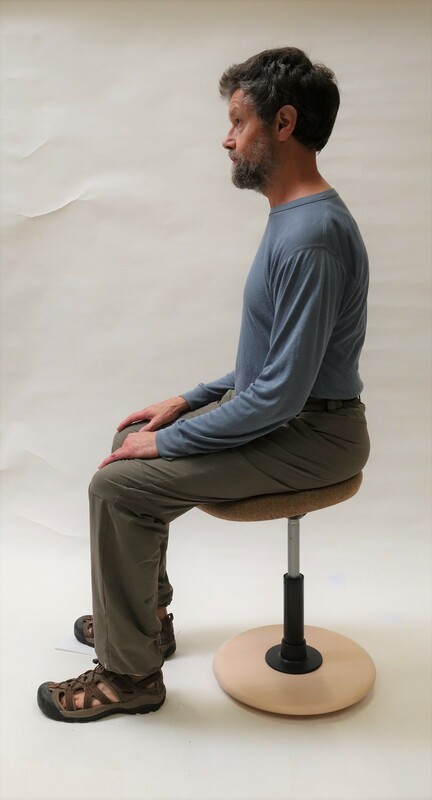 This helps you sit more easily in a relaxed but upright and alert posture, which is natural and unstressed for your back. It feels relaxing and invigorating at the same time. Occasional gentle rocking sideways, or in small circles, can feel like a back massage, helping aching muscles to relax. We talk here about freedom of movement, but most users choose to sit with only imperceptible movement, most of the time. It's the knowing that you CAN move that feels so liberating. The price, including delivery, will be ₤320. You can use it for all 'active' sitting, this includes most uses at a desk or table, especially computing. Balancing is easy, we do it without even noticing when standing or walking. Balancing while sitting can soon become the same, but it does need you to want to remain alert. For relaxing when you are tired, watching TV, and perhaps for reading, most people will prefer a chair with a backrest. If you have backpain so severe that it is hard to sit down, such as a recent slipped disc, it is worth trying for these uses too, as our wave stool has helped people like you. Most of our wave stool's Uses and Benefits apply to posChair 1 too. We make posChair 1 with a 'Relaxed' or an 'Active' rocker. Both are included with a trial stool. They are cleverly shaped so you can feel when you are approaching the limit of stability - they tell you how far you can safely rock. 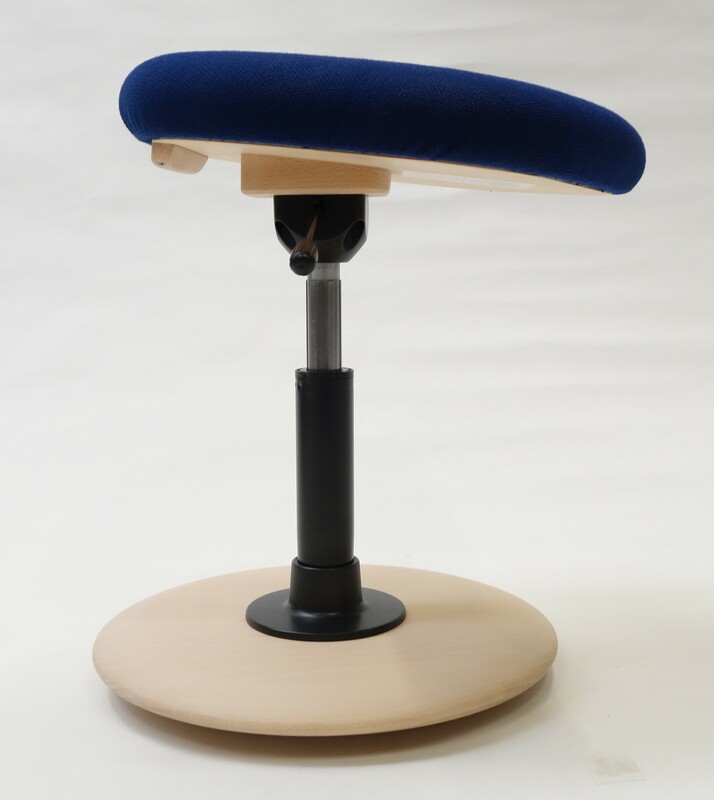 You will probably like this if you like yoga, tai chi or Alexander Technique, or you want the freedom of movement of a gym ball, but with a supportive seat that you can sit on all day (although you can't bounce on it). You may prefer this if you are quite sporty, perhaps a cyclist, skier or dancer, or you really don't like having to sit still (although it is easy to sit still when you want to). It's even more invigorating than the relaxed, like the difference between a hybrid and a road bike. If you take naturally to this you may find the relaxed a bit dull and static by comparison. posChair 1 relies on your feet being in front of you and slightly apart for stability, so it's not suitable for very tight skirts. Check you are comfortable sitting with your feet about a foot apart. If you always want to tuck your feet under you it probably won't feel stable enough. It is designed to be used at normal seat height. 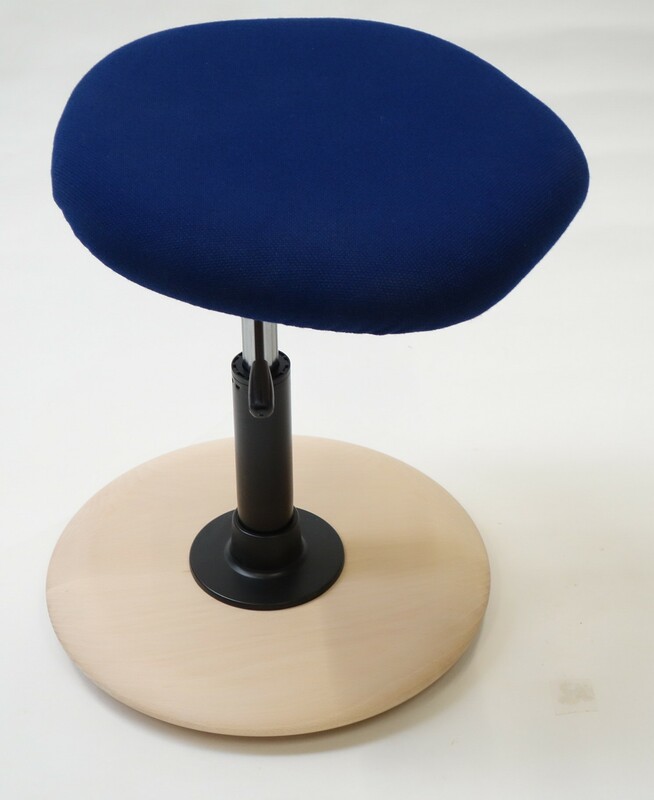 It is not a sit stand stool, and using it too high for your leg length will lose the benefits for your back. If you need to sit very low down (for you) you'll probably prefer a horizontal seat. It can be adapted to be horizontal, and we can make it with a very low gas lift - please ask. Swivelling and possible floor wear. It is fitted with a non swivelling gas lift, to stop the rocker rotating and moving across the floor when you don't want it to. The curve of the rocker still allows you to swivel it, but doing so frequently may wear some floors, particularly laminated ones. On some of these the veneered surface is very thin. A small mat or piece of carpet would protect your floor. How easily it rocks and swivels depends on your floor. Very freely on hard floors and less on deep carpet. Old uneven floors will feel a bit bumpy when you rock.